I am proud to announce a brand new product which will be available exclusively on this site in the very near future. 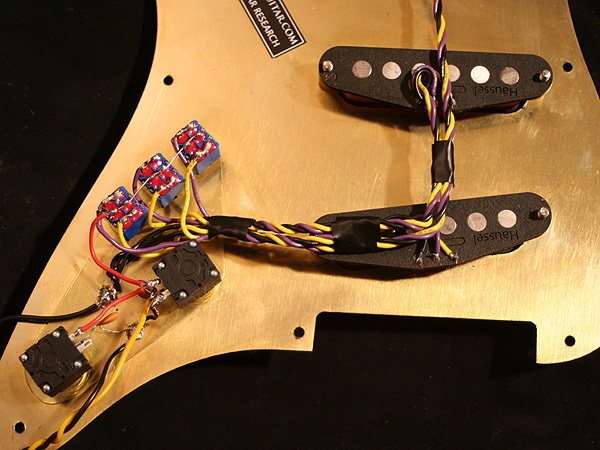 For a long time those vintage Schecter pickguards, loaded with the sought-after F500T tapped Schecter pick-ups, have been the ultimate tool to convert your guitar into something similar to the legendary Schecter Dream Machines, or as a start point to build a high-end custom Strat. With those three mini switches and the tapped pick-ups you can select from not less than 27 pick-up combinations, ranging from the classic Strat sounds to fat p90-like blues sounds. 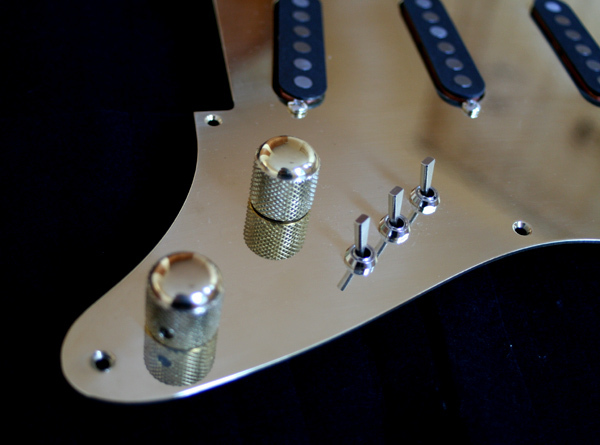 The loaded Schecter F400 pickguards came with the Dream Machines, or were available separately to upgrade your Strat in the 70ies and early 80ies. Anyway, they are extremely rare and for this reason almost impossible to get. No wonder that used items have sold for up to 1,500 USD on ebay since then. I had the idea to build one of these for myself but I soon found out that the price will be astronomical for two reasons: most of those fancy parts like for example the American flat-lever mini switches or the conductive plastic potis are hard to get, and if so only in certain quantities. 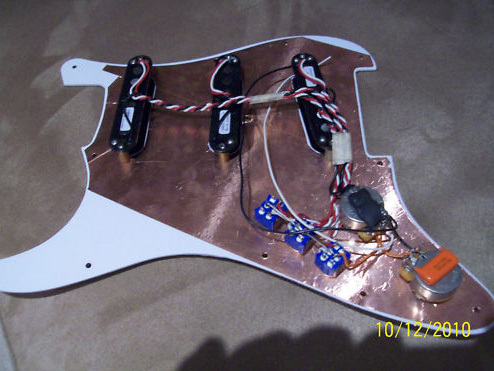 Also, some jobs like constructing the pickguard in AutoCAD to get a vector file that controls certain high-tech machinery imply an enormous amount of work and time, and would not pay for just one single board. So the idea of a small production run was born. The core idea of Schecter was to offer upgrade parts for your guitar, and as an upgrade these need to be of superior quality. Mind that a complete Schecter Dream Machine was never considered as as Strat copy because even back then it cost a multiple of the price for a US Fender Strat. Everything was made with finest parts. The potis for example were not simply some potis, they were US made conductive plastic potis for extended life, fully dust capsuled. When you turn them, they do not feel like a crappy Chinese poti found in many guitars these days. Instead, they have that creamy tight feel you associate with the volume knob of an expensive HIFI amplifier. We have them again! Or those mini switches: they are still available today but normally they have a round lever instead of the flat one. I indeed found Asian switches with flat levers that look alright but if you compare them with the real stuff, they simply feel different, they rattle, and – call me a snob – when you switch them, the “click” sound is different than with the US switches. Finally I managed to get hold of US made switches, they cost me three times as much as the Asia stuff but it is worth the price. I even got those fancy round dress nuts for the switches, essential for the authentic look. Another problem were the pick-ups. The original Schecter F500T was a tapped pick-up for both the classic Strat sound and a fat, warmer lead sound. The ones you see on ebay are extremely expensive, or often defective. It seems many of them have problems after some decades, something which is also true for 50ies Fender pick-ups. A few companies, e.g. Seymour Duncan, still make pick-ups that are somewhat similar to the F500T. However, similar was not enough for me, so I teamed up with one of Europe’s hottest pick-up winding gurus – Harry Häussel – to come up with something superior. 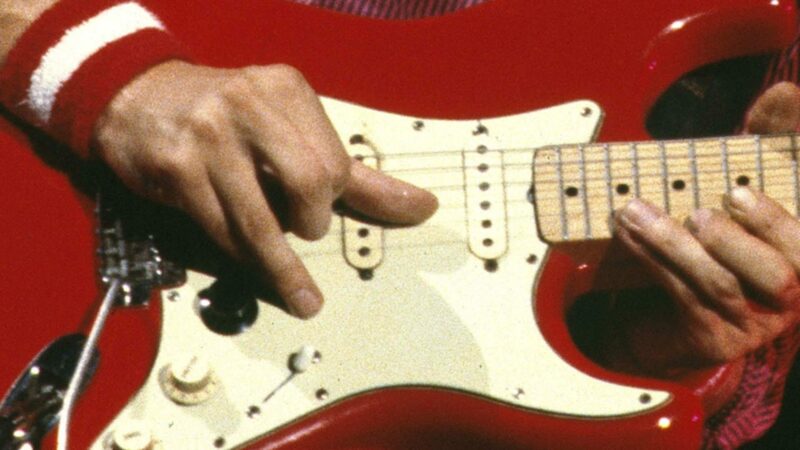 Those of you who know Harry’s outstanding vintage Fender replicas will not be surprised to hear that our pick-ups are made with real love and attention to even smallest details. They have the same kind of magnets, the same winding wire, the same winding method. I even got American gauge cables of the same colours – black, yellow, and purple – simply because the European cable gauges looked too skinny, or were too fat. 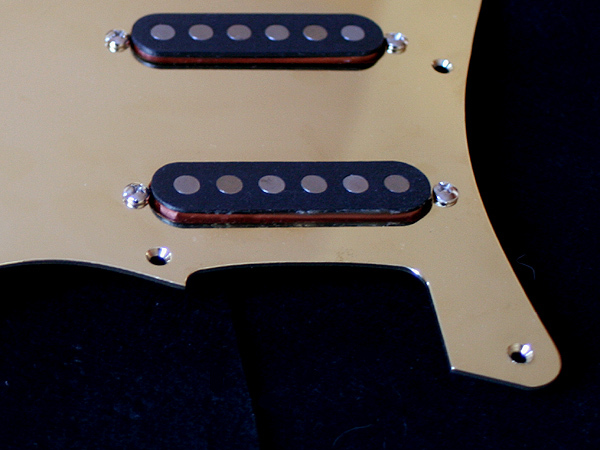 Our loaded pickguards should fit on all Strat-sized guitars (8 holes like vintage Schecter). * Made of solid brass (alternatively white aluminium), professionally high-tech cut to our specifications in Germany, professionally polished for that magic, shiny look. 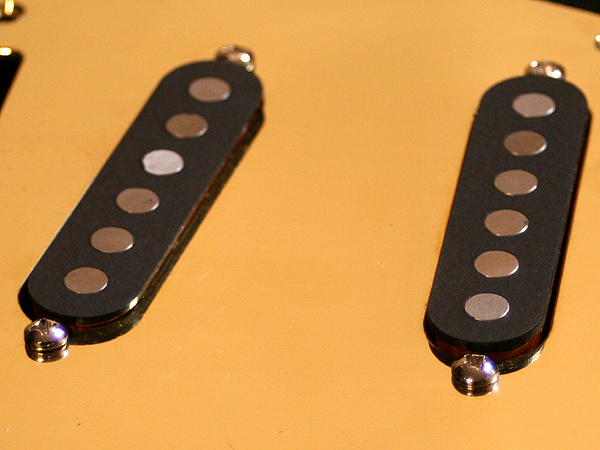 * Hand-wound pick-ups for that F500T sound. 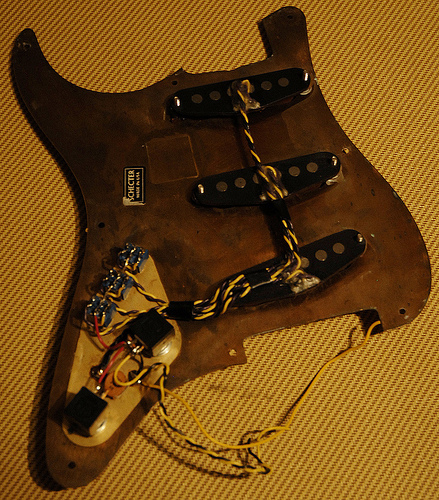 Magnets, wires, winding etc., like vintage Schecter. These are definitely not the cheapest but the best! ... and another vintage Schecter. 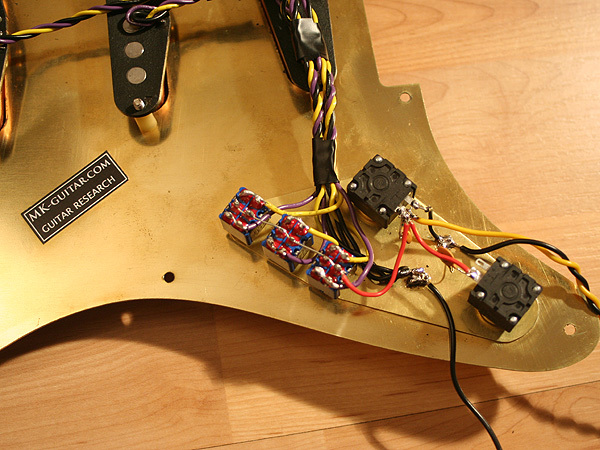 Compare to the previous picture and note that Schecter used switches and potis from different manuafacturers. Wow. Really cool man. I want one. This is awesome, I’ve wanted one of these for some project guitars for quite sometime. I’ll be sure to get one. Looking forward to it! I’m very interested in one of them. Please, tell me when you finish one of them to buy it. Wow looking forward to these big time!!!! Want one depemding on price of course!!! Great idea Ingo! 419! 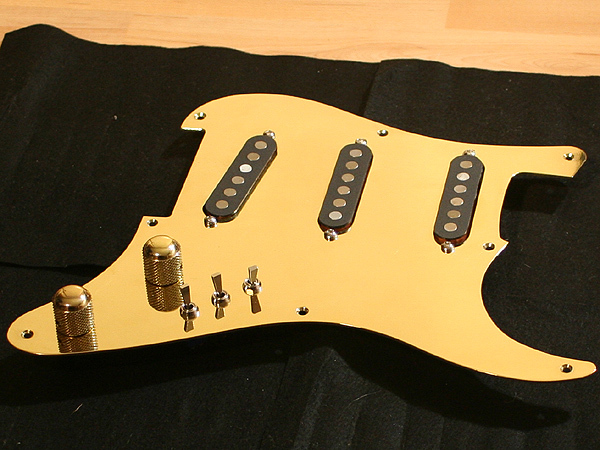 I’ll have one, how long will those pickguards stay in production and what are the shipping costs? And how can I pay? It is available in this site’s online shop, the shop will calculate the shipping costs for you according to the country you live in. At the moment only a first few are available, more coming soon, the white pickguards will be at the same price, availably probably by mid January. I will be putting myself down for at least one in the new year when we get Christmas expenses out of the way I hope the production runs lasts that long, good work Ingo and team!! Very great news about the white pickguard for the CAR schecter. Can we expect to load different pick ups (like Lindy Fralin or Seymour Duncan) instead of F500T schecter style pick ups ? Will the parts be available seperately, too? i have a problem but it really doesnt have to do with this, but i have an anodized gold fender strat pickguard on my MIM sunburst strat and its dull not shiny. 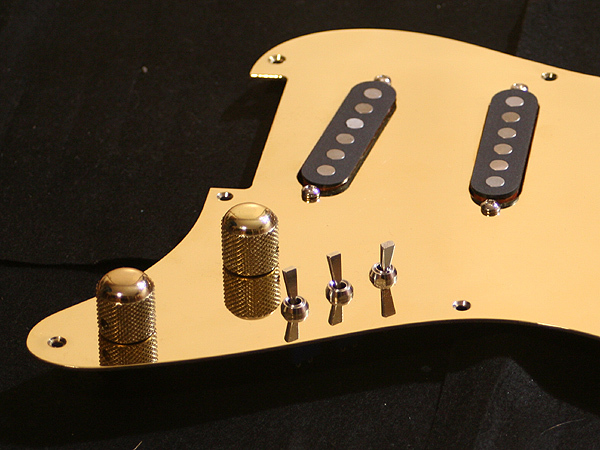 does anyone have any ideas on how to shine it like these pickguards or any ideas on where i would take it to get it shined professionaly? Ingo, marvelous work my friend. I am sorely tempted by your promise of the highest quality etc. However I have to pay off a car and buy a writing bureau before I can buy. Do you think you will still have these in about a years time? Noone can predict the future, but as long as enough people want them, I can continue producing them of course. hey, is there a possibility that the pickguard can be sold alone without the pickups in them? and if so around what time in the future will they be available? can you put white pickup covers on these with the white pickguard ? Hi, I am the proud owner of a ’79 dream machine as well as a later Dallas Schecter strat fitted with one of your excellent VFS-1 assemblies… My question is could you a consider building a similar assembly to fit a Fender Nashville Telecaster with Schecter style pickups and the three switches instead of the five way switch..? I am sure there are other pickers out there that would consider this, it would also complete my dreams in my quest for the perfect combination..
Is it possible to be the brass guard loaded with the VFS pups ?? Also how much would postage be to Australia ? You can email me if u like. Can’t wait to use this set-up live and experiment. 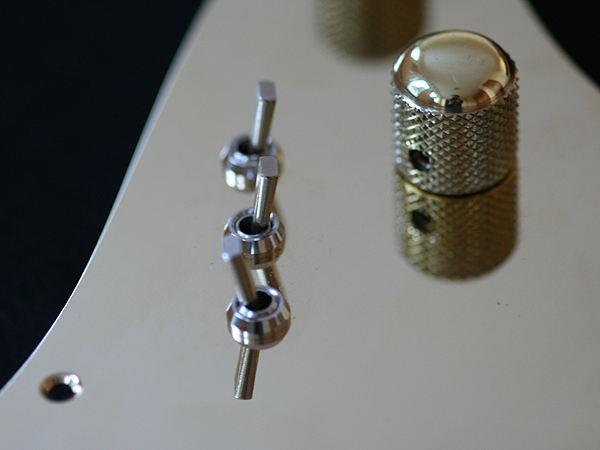 Thank you Ingo, for such a great and affordable product – of course I feel like I have a transformed Strat ! 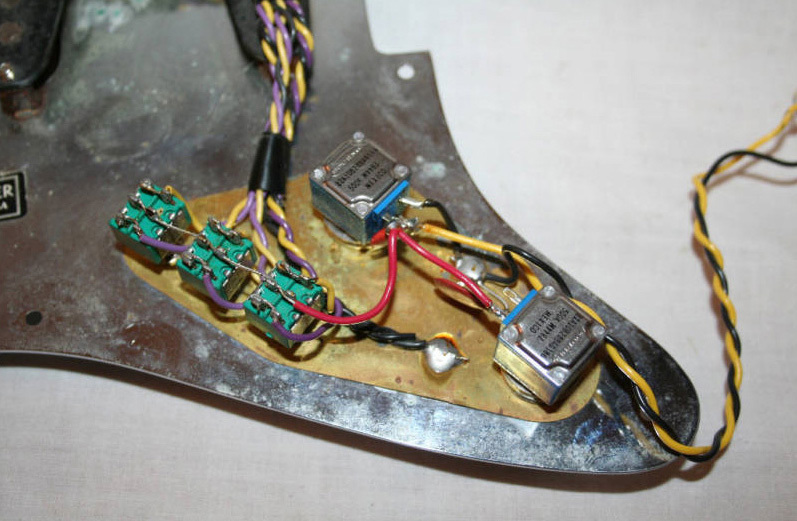 I was wondering, what was the resistor value with this F400-pickguard(250k/500k)? I’ve been playing more and more with my VFS-1 strat because the one with the F400 pg tends to sound too dark even thou it has maple neck. I was thinking to replace the resistor for bigger value. I must admit, I love the sound of my VFS-1 strat! 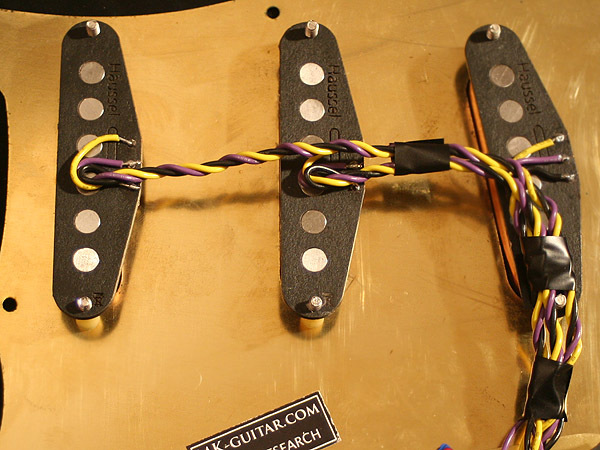 Ingo, what is the DC resistance of these pickups, full coil and coil tapped?